A few weeks ago I had accidentally defrosted an extra Italian sausage from our freezer, and I decided to make a pantry type casserole (meaning I use whatever I have in the kitchen at that time to put something together). I made some quinoa (soaked and then cooked according to package directions, except reduced the water by about half since I had soaked it), peeled and trimmed a few baby artichokes I had on hand and then par-boiled them (meaning I cooked them in salted boiling water until just tender), and then I browned the sausage. I then oiled a glass pan and laid the quinoa down, sprinkled about 3/4 cup chopped parsley and thyme, then the sausage, then the artichokes. 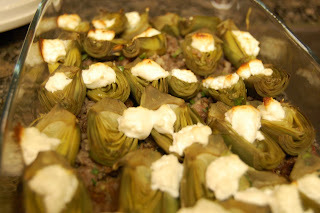 I topped it with a dollop of goat cheese on each artichoke half and baked at 350 for about 30 minutes (until goat cheese was brown). So easy and so tasty! Next time I am going to mix the quinoa, herbs, and sausage with 1 or 2 eggs to help hold that mixture together. You can make casseroles like this ahead of time and bake the night of any time. They are great because it uses whole grains (you can use rice, quinoa or millet for gluten free versions or spelt for a non gluten free option), everything gets cooked in advanced and all you do is assemble. It is also an easy way to get herbs into your meal. It also creates a balanced meal with good proteins, carbohydrates and fat with vegetables. The best way to round it out is to serve with a side of vegetables like a salad and you are good to go. Green garlic, spring onions, romaine lettuce, red lettuce, spinach, carrots (with the tops, which you can eat! 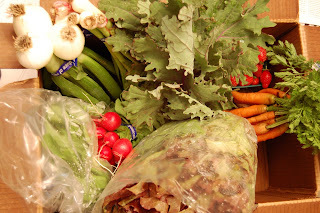 ), radishes, strawberries, red russian kale and strawberries. The carrots and radishes will make great raw veggie snacks as well as impromptu toppings for salads. At the farmers market I picked up some of my favorites to supplement like the Guisti Farms baby artichokes (great taste, good for the liver and great for spring eating) and nectarines and apricots from the main fruit stand (if you walk by a booth and the perfume of the fruit overwhelms you - you can bet the fruit is worth buying). So what we ended up with in our house is an abundance of lettuces and leafy greens, and some aromatics to enhance some meals (garlic, onion, etc). With more research, you can come up with some more extravagant meals for these ingredients, but I love keeping it simple - for both time as well as preservation of the flavors that come from farm fresh, organic produce. So this week there are more salads and simple balanced meals (meaning good quality carbohydrate, protein and fat supported with an abundance of vegetables). I have talked about this before, but I wanted to share again. The best way to entertain and leave people feeling taken care of and nourished, is to keep it simple. Yes, simple is best! Some of my favorite TV chefs talk about this all the time - Mario Batali (an expert on cuisines of the different regions of Italy) and Ina Garten (a Martha Stewart type chef who puts high values on quality and refinement of food). If you pick, fresh, and good quality ingredients and cook them as they were made to be prepared, you will inevitable create a good meal. Spring is one of the best times for chicken. Eggs are also abundant right now. The herbs which were stuffed into the chicken not only impart flavor, but also have their own special nutrition and now that I have my herb garden out front, I have no excuse but to use them! Spring is also a great time for veggies like artichokes and zucchini. Here in Half Moon Bay we almost always have artichokes. They are great for the liver and gall bladder, and spring is definitely a good time for cleansing and supporting the liver. I used baby artichokes for this meal - the trick with either baby or full artichokes is to peel back to the tender leaves, trim the tops and bottoms, par boil (boil for a few minutes until just soft) and then roast so you still get a tender but crispy texture. Fava beans and peas are also some of the lighter plant items like fava beans and peas. Served with quinoa (which I soaked the night before to help with digestibility) is an easy way to deliver their taste without overbearing the palette. 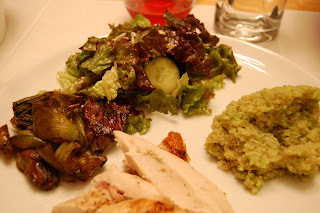 Lastly, the green salad is a great way to get herbs, plus fat with the olive oil and very nice flavor. Not to mention fiber, vitamins and bulk to the meal. Dessert was simply fruit (strawberries and raspberries) alongside Coconut Bliss ice cream. This is a great product based on coconut milk and meat, agave nectar (which in moderation I am a fan of compared to other sugar products). Again, really simple so it was easy on me, and everyone left feeling great. Just a quick note, hamburgers on Monday are in quotes because we don't eat these with buns in our house (no gluten) and we grind our own beef so it is not your average old patty slapped on a grill and smothered in mustard and ketchup (or mayo for some of you). We caramelize red onions, roast anaheim peppers and add thin slices of raw milk jack cheese from Greenbank farms to make a healthy, and delicious version of a mex style burger. You may have also noticed the homemade Italian sausage. We keep this like bulk sausage - we tried the casings, but oh me oh my that was a little too much work. We use the grinder attachment for the kitchen aid mixer. It is great. Only about $50 and this process literally takes no more than 10 minutes. In exchange you know exactly what goes into your ground mixture (do you really know when you get it from the store?) and you can control the thickness of the grind (great when you want to make a killer burger to be able to do a coarse grind).